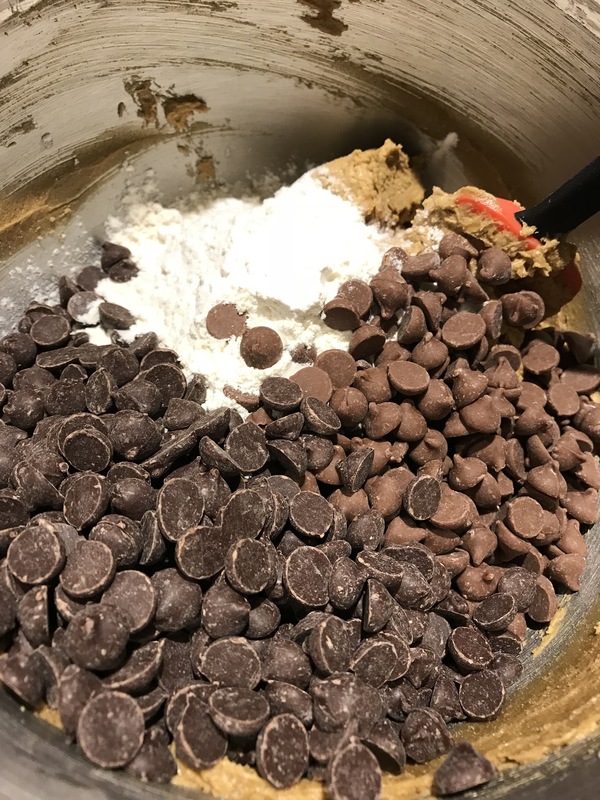 There are so many variants of Chocolate Chip Cookie recipes out there that you ‘d be hard pressed not to find one that suits your own personal cookie preference. For me, as long as they are exactly like (or very similar to) the ones you get at Subway, then I know that I am on to a winner. I personally like mine cooked through but slightly underdone; leaving it still soft, chewy and moist. 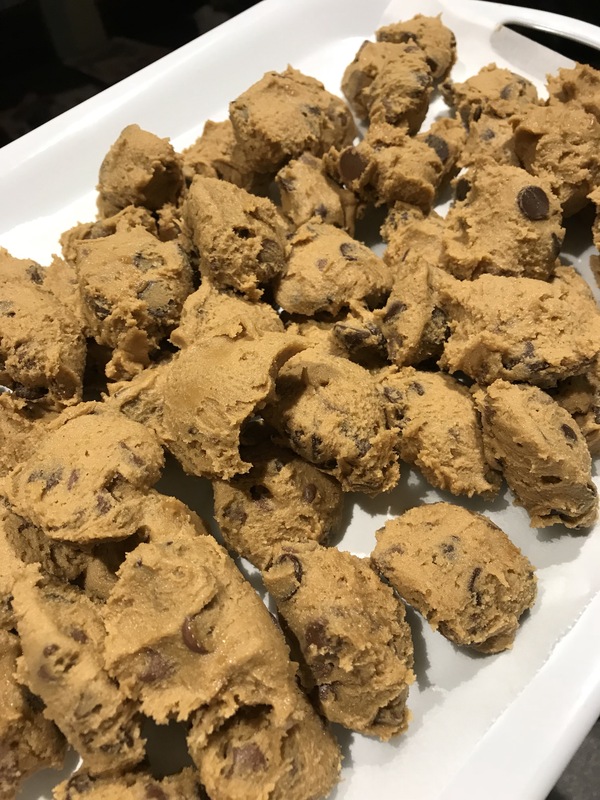 This is my recipe, which I suppose with most cookie recipes, yields a different result based on the state in which you bake them in – completely chilled or room temperature soft. One thing is for certain though – they will taste great at whichever end of the cooked spectrum you wish to take them. 300 grams of dark brown sugar. 1 teaspoon of granular salt. 250 grams of unsalted butter. 2 teaspoons of good quality vanilla extract. 300 grams of plain, all purpose flour. 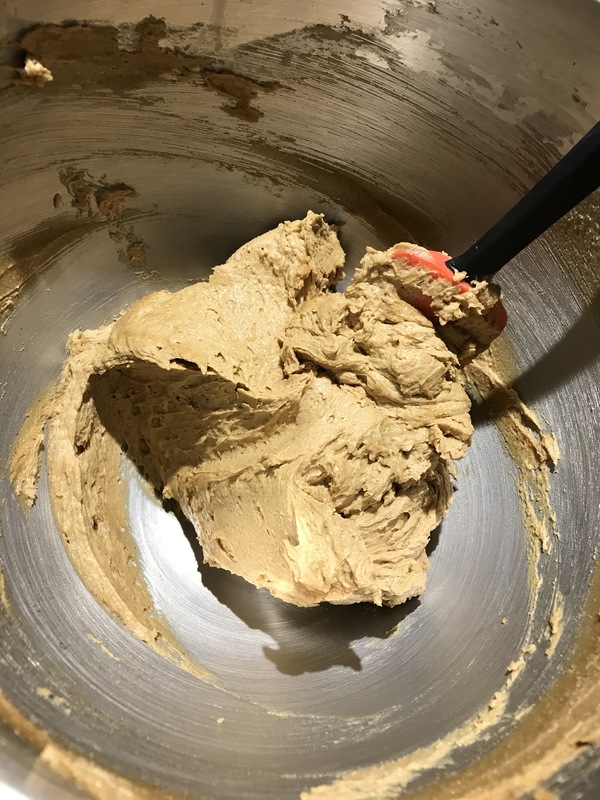 Beat the butter, dark brown sugar, salt & vanilla in a stand mixer (or by hand) until the darkness of the dark brown sugar becomes a light and pale cream with the overall texture resembling a light buttercream. Once this is done, stir in by hand the beaten, room temperature egg until it is fully incorporated. 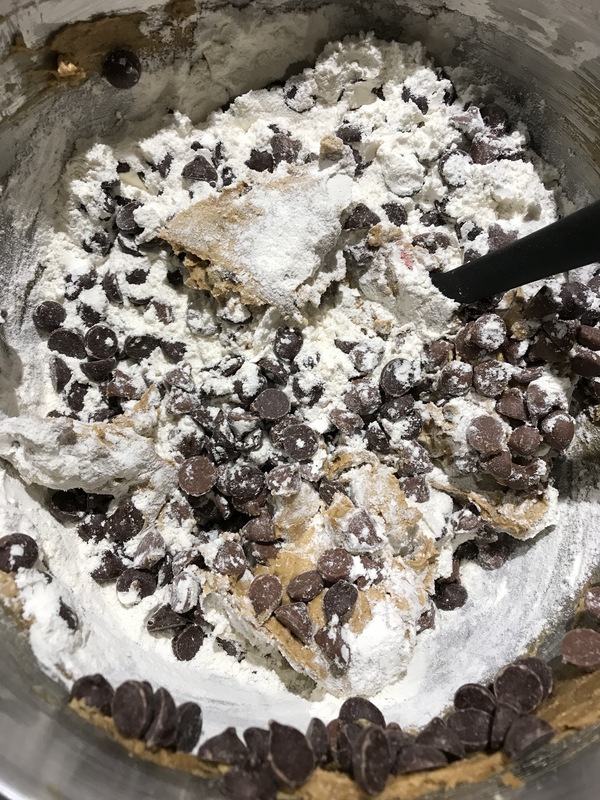 Remove the mixing bowl from the machine and incorporate all excess ingredients from the paddle. You now need a hefty wooden spoon – something with a thick handle. This is because the next step requires you to hand stir a stiff dough, which means you need a utensil with a bit of integrity. I’ve used a thin wooden spoon once, and that was the only time I got to use it! Add the flour, bicarb soda & chocolate chips. Stir well to combine. By well, I mean you mix it all until you see no more white flour. You won’t over stir it – don’t worry. 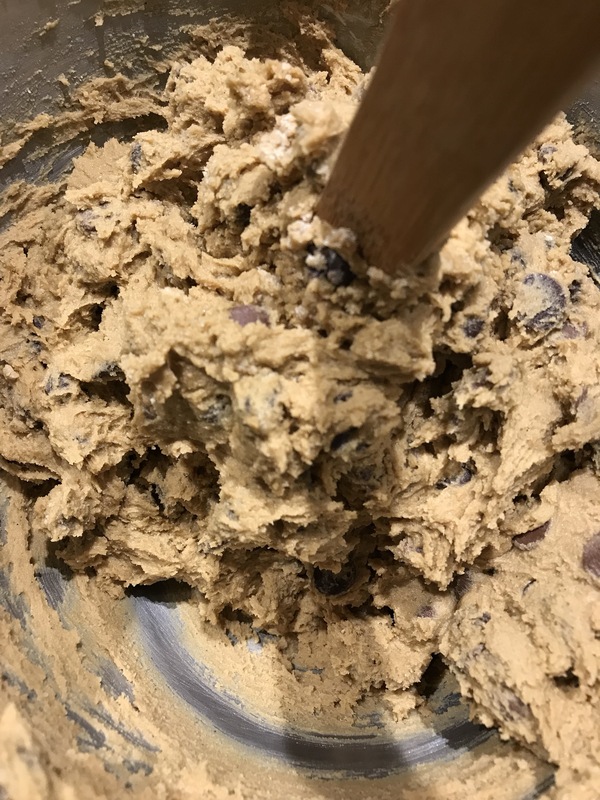 Now that it is mixed, and for all the time you’ve spent in the whole process, you should end up with a fairly soft, evenly coloured & textured cookie dough that is easy to scoop. 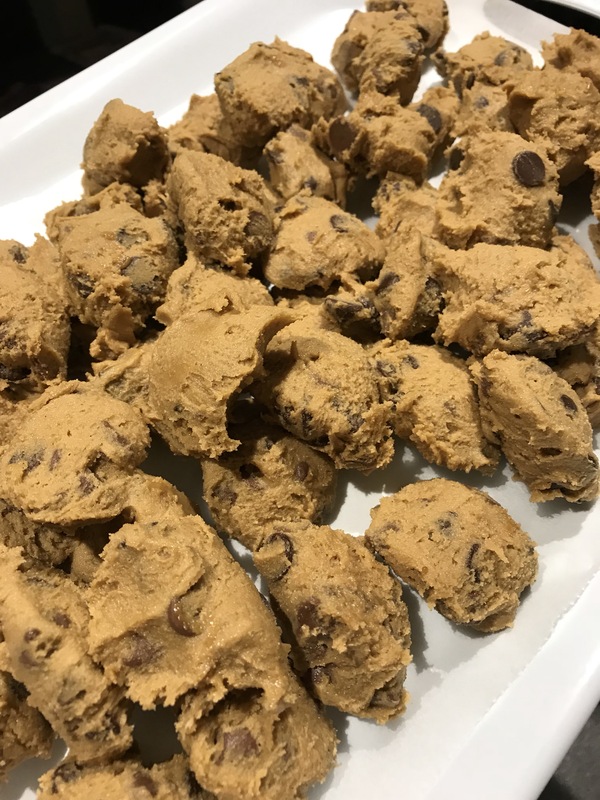 To make even sized cookies, use a tablespoon. 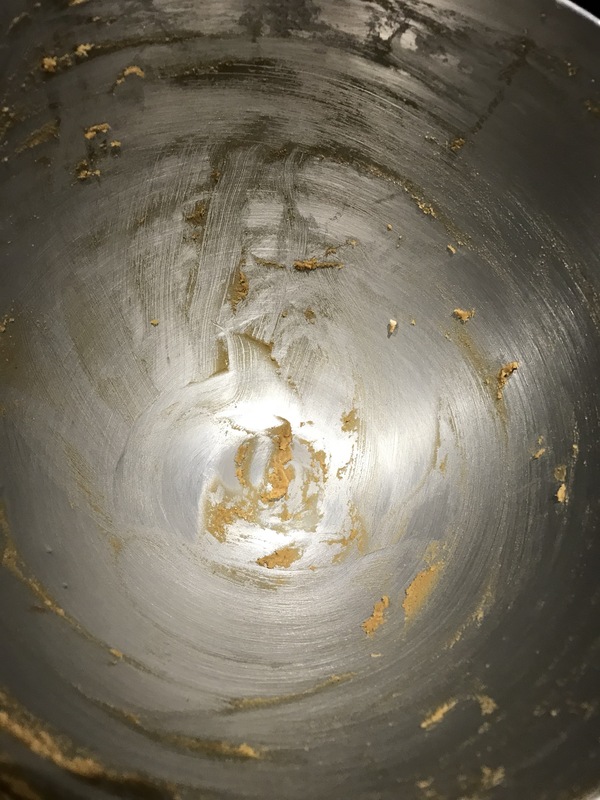 Scoop a portion of cookie dough and scrape the top of the tablespoon against the top of the bowl (upside down of course). 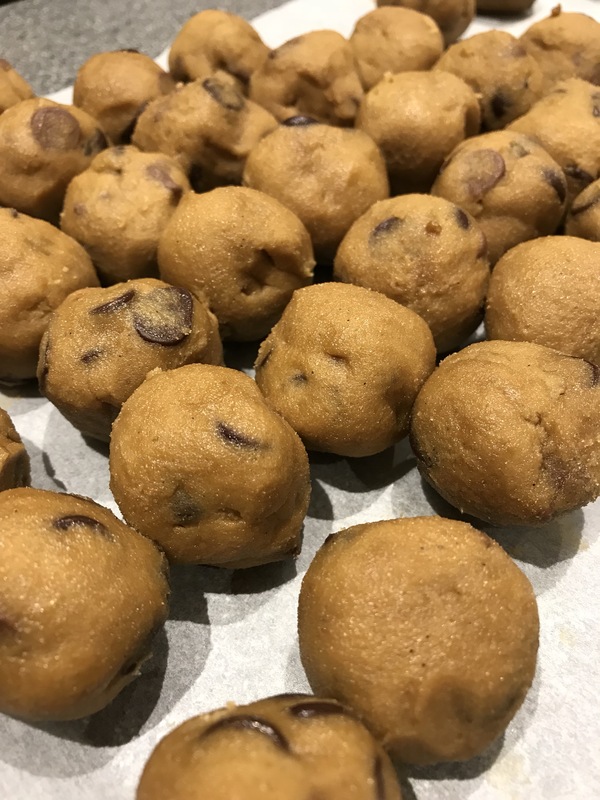 This gets rid of any excess cookie dough and gives you an even measurement, with a portion that is about 21 grams on average. Use your fingers to get the mix out of the tablespoon and pile them on to a tray. Don’t bother shaping them into balls at this stage or they will just get too soft and become hard to work with. Pile the individual portions onto a tray and place them in the fridge for about an hour until the portions firm up. This makes it easier to roll between your hands later on into (fairly) even balls without them softening and becoming too sticky to handle. You can either bake them at room temperature like this or chill them completely in the fridge. This will take about 3-4 hours. Whichever route you decide to take, the next step is to turn your oven on to 170 degrees celsius. 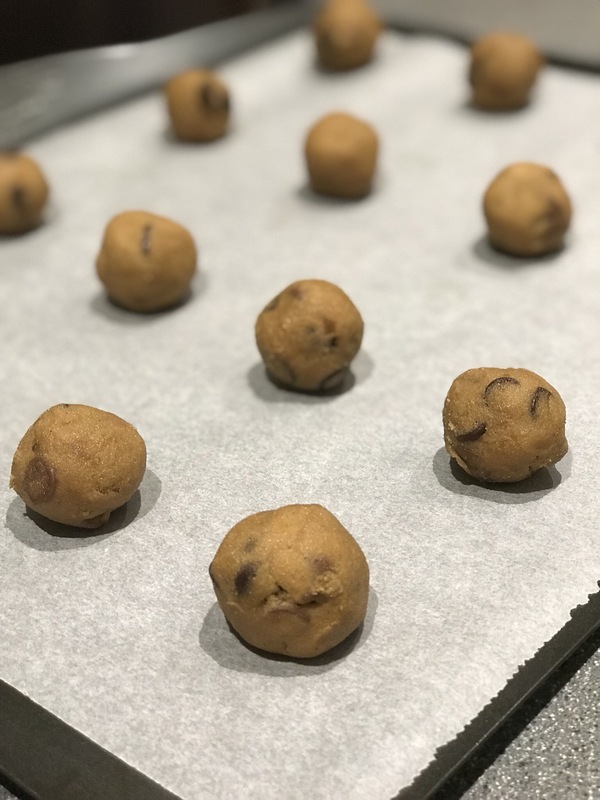 Spread the cookies out onto your lined oven tray, ensuring there is adequate spacing so that the cookies don’t touch each other when they spread out. If baking at room temperature, they will need about 8-9 minutes, depending on your oven. You will probably get some odd shaped cookies here and there, which is fine if you aren’t fussy about size. If baking from the fridge, they will need about 11-12 minutes, depending on your oven. You will probably get a more even sized cookie doing it this way, which is great. Once the time is up, remove them from the tray with the liner still in tact. DO NOT try to pry them off the baking sheet whilst they are still warm or they will fall apart. This is especially true with the warm chocolate chips, as chocolate takes a long time to become ‘solid’ again after being heated up. I slide cookies, liner and all onto the kitchen bench top, which is generally quite cool. This helps with bringing down the temperature of the cookies. Once the cookies are cool to the touch, carefully remove them from the lining by sliding a wide offset spatula underneath and transferring it on to a wire rack to completely cool. They can then be stored in an airtight container. I find that the cookies taste a lot better the day after and have an even texture throughout. Enjoy! Do let me know how you go if you choose to try this recipe!